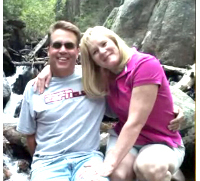 Harold Henthorn and his wife Toni. Harold Henthorn, 58, from Denver was indicted by a federal grand jury for first-degree murder of his wife Toni Henthorn a successful ophthalmologist. The two went hiking in Colorado’s Rocky Mountain National Park for their twelfth wedding anniversary. Toni went over the side of a cliff and died before help could arrive. Harold is suspected of pushing her to her death. “Harold Henthorn seemed controlling and dishonest about the couple’s financial situation, lying about a business he claimed to own so that Toni would move away from her family in Mississippi to be with him in Denver,” said her brother, Todd Bertolet, according to the Associated Press. Henthorn stood to inherit hundreds of thousands of dollars from the $4.5 million in life insurance policies written in his wife’s name. Court records show a claim was submitted just two days after her death. The circumstances surrounding the death of Henthorn’s first wife are being investigated as well. Woman killed in national park had $4.5M insurance, on News.Yahoo.com. This one is so classic it’s unbelievable. Also, look at that charming smile.